Andruw Jones was born on the 23rd April 1977, in Willemstad, Curaçao, and is a former professional Major League Baseball player, known as a designated hitter and outfielder for the MLB teams the Atlanta Braves (1996-2007), Los Angeles Dodgers (2008), Texas Rangers (2009), Chicago White Sox (2010), and New York Yankees (2011–2012). Jones was a five-time All-Star participant (2000, 2002, 2003, 2005, and 2006), and won 10 x Gold Glove Awards (1998–2007), as well as being the MLB home run leader in 2005. His career started in 1996 and ended in 2016. Have you ever wondered how rich Andruw Jones is, as of late 2016? According to authoritative sources, it has been estimated that Jones’ net worth is as high as $50 million, an amount earned largely through his successful career in professional baseball. In addition to spending 16 years in the MLB, Jones also played in Japan, which improved his wealth too. Andruw Jones started playing baseball from an early age; when he was 11, he was a part of a youth team who went to the tournament in Japan. In the beginning, Jones played as a catcher or third baseman, but later he moved to the outfield. By the time Jones turned 15, he was the best player in Curaçao and played for the national team in the Latin American Games. In 1993, Andruw joined the Atlanta Braves as a free agent, and firstly played for the Braves farm team in West Palm Beach, before he was promoted to Danville of the Appalachian League. In 1995 Jones was the Minor League Player of the Year, finishing the year with 25 home runs, 100 runs total, and 56 steals. The Braves activated him in August 1996, so Andruw debuted in the Major League at the age of 19. The Braves won against the St. Louis Cardinals in the National League Championship Series, then played in the 1996 World Series, and although Atlanta was 2-0 ahead of the New York Yankees, they lost the series 2-4. During the World Series, Jones broke Mickey Mantle’s 20-year old record as the youngest player to score a home run. Jones moved to center field in 1998, and won his first Gold Glove Award while the Braves won over the Cubs, and later played in the 1998 NLCS, but lost to the San Diego Padres 2-4. In 2000, Jones was selected for his first All-Star game, although the Braves lost the National League Division Series against the Cardinals. He also participated in the All-Star game in 2002 and 2003, while in 2005 Andruw became one of the best players in the league,the winning Silver Slugger Award, NL Hank Aaron Award, and being the NL RBI leader, and MLB home run leader, thus securing a place in the All-Star game, but his Braves didn’t pass the Houston Astros in the National League Divisional Series. In 2006, Andrew recorded 107 runs and 41 home runs which helped him to appear in his last All-Star game. His net worth was well established. In December 2007, Jones signed a two-year deal worth of $36.2 million with the Los Angeles Dodgers, but he had a disastrous next two seasons as he struggled with a knee injury. The Dodgers released Jones in January 2009, but only a month later he signed a contract with the Texas Rangers for around $1.5 million. He subsequently signed a deal with the Chicago Cubs in November 2009 for $500,000 plus $1 million in bonuses, then in January 2011, Jones joined the New York Yankees on a one-year basis, signing for $2 million plus $1.2 in bonuses, while in 2012, he re-signed on a one-year contract for $2 million. His net worth was constantly rising. In December 2012, Jones left the US and joined the Japanese team the Tohoku Rakuten Golden Eagles on a one-year $3.5 million deal, re-signing with the Golden Eagles in a $3.8 million deal in 2014. 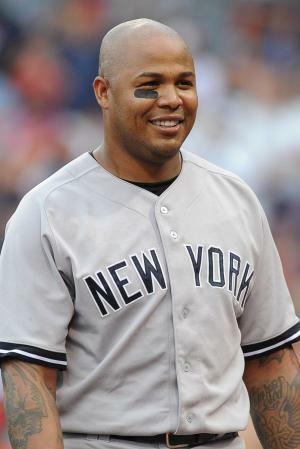 After attempting unsuccessfully to come back and play in the MLB in 2015 and 2016, Andruw Jones announced his retirement in February 2016. Regarding his personal life, Andruw Jones married Nicole Derick in 2002, and they have a son and a daughter, but divorced in 2013 after Derick reported domestic violence in 2012. Jones also has another daughter with April Caraway. 3 Is the youngest player to hit a home run in World Series history at 19 years, 5 months, and 27 days. 4 Named to Baseball Digest magazine's 1997 Rookie All-Star Team. 5 Made major league debut on 15 August 1996. 6 Former outfielder with the Atlanta Braves (1996-2007).